Up-update: 10/10/08 — That potato pizza keeps me coming back! Masullo seems intent on growth. Each time I’ve been there I see some additional sign of thoughtful improvement. Don’t be put off by the line. It moves fairly quickly. Update: 8/28/08 — I went back. See below at the end, but read my post on the way there. For many of my friends in Sacramento, it has long been a source of frustration that this city has practically no outstanding restaurants. Waterboy, ok, though the food is often underseasoned. Mulvaney’s, sure, but too noisy for expensive B+/A- food. Randy Selland’s little empire is too pretentious to take seriously. A little calm humility would go a long way towards making dining in his establishments worth the money. The various incarnations of Paragary’s eateries are reliable and affordable, but not exciting. There are other good restaurants, but I rarely feel the quality of what I eat is worth the cost. Last night, I ate Robert Masullo’s pizza for the first time. A friend and I decided to try his little pizzeria that looks very unassuming from the outside. By the time we left, the meal had satisfied me in a way that few meals have in this town. Masullo’s in a work in progress and I intend to come around often to watch it grow. To begin with, when you walk in, the decor is cleverly minimalist. A white cinderblock wall with simple wall decorations on one side of the narrow dining room, a long wooden table lined on both sides with backless benches, and four tables for two along the other wall come before the tall metal-covered serving counter. Behind it, center stage is the mouth of a wood oven with a blazing fire in view. A slim young man wearing a red cap, who turned out to be the owner-chef, Robert, slid a pizza peel in and out of the oven. I liked the feel of the place right away. The menu is simple — another plus. You can see it here. The toppings evoked fond memories of the hundreds of pizzas I have eaten over the years with my Venetian friends in Mestre, admittedly not the epicenter of pizzaioli in Italy, but still a working-class city over the bridge form Venice where good pizza can easily be found. (Odd: I’ve never seen an Italian eat pizza with anything other than fork and knife.) Robert’s sister, Madeleine, who served us, told us he’d spent a lot of time in Italy learning how to make pizza. His time was well-spent, as the sausage pizza and the arugula and prosciutto pizza we had made clear. The dough, however, is too doughy. Chris Bianco of Pizzeria Bianco in Phoenix, AZ, deserves his reputation as one of the best pizzaioli in the country. If I didn’t fear giving offense, I’d recommend that Robert adapt Bianco’s dough recipe. Still, Masullo’s dough is better than most others in this town. Good pizza dough is an art. It should be crisp on the bottom and slightly chewy on top without being spongey. The wine list also a work in progress. Not a great selection, but it’s certainly affordable. We drank a nice bottle of local wine, Boeger’s Tempranillo. At $18 a bottle and about $11-$12 a pizza, I thought it was a bargain considering the quality of the meal. My only wishes — aside from a slightly improved dough — is that I hadn’t had to ask for a little olive oil to drizzle on the pizza (fresh, uncooked arugula on pizza is great, but needs a little oil to help it slide down the gullet), a few more slices of Fra Mani sausage on the sausage pizza (sure, it costs a fortune, but if you’re going to use, use it, or buy a good, locally made variety), and, call me a pedant, but grana padano cheese is spelled with one ‘n’ and not two and is not a town. 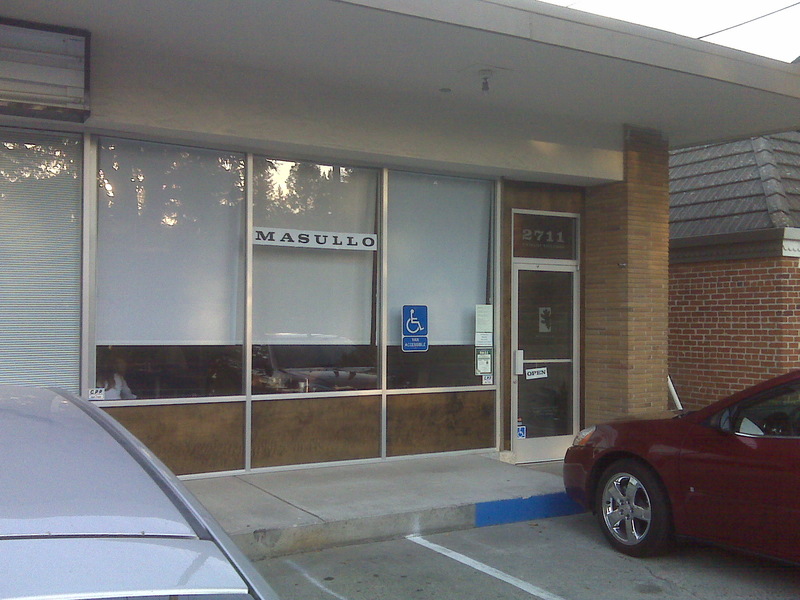 Masullo’s is a welcome addition to a small selection of excellent, comfortable, affordable neighborhood joints worthy of our patronage. It’s not the only place to eat in Sacramento that where the chef put his generous heart into his food. But Robert’s pizzeria could quickly win my loyalty if he continues to aspire to the Perfect Pizza. 8/28/08: Tonight I and four friends shared four excellent pizzas at Masullo’s. The dough was thin, crisp, and chewy. One of our group noticed that the tomato sauce tasted like it was made in-house from good tomatoes. How often do you notice THAT in a pizzeria? I tried a pizza I hadn’t had before: thinly sliced potatoes topped with good bacon — not pancetta, though I think I may be excused for thinking so at first, given the quality of the bacon. This was my favorite pizza. We also ordered the eggplant pizza (thinly sliced red onions, pine nuts), very good. Robert Masullo ought to take the lead and gently prod people in a new direction in eating pizza. It’s unlikely that Americans are going to embrace using a knife and fork. But still, an investment in olive oil cruets, placed on the table with a suggestion that diners might like to drizzle it on some of the pizze, might help to heighten the appreciation of what they’re eating.